Fall is finally here an pumpkins are popping up everywhere! I’m not a big fan of carving pumpkins, so Mr. Smart School House does that with the kids. I sure do love decorating with pumpkins though! 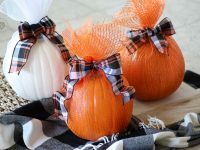 Today I’m sharing these Pumpkins Wrapped in Mesh tutorial. 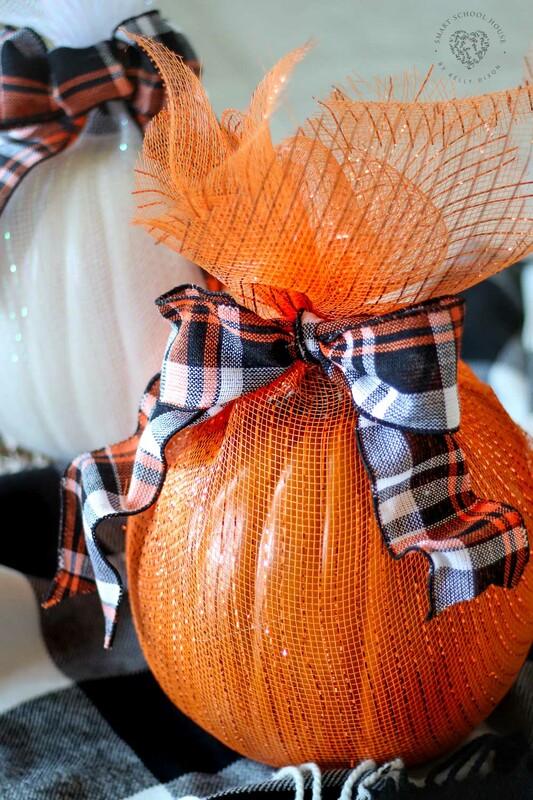 I love how the pumpkins sparkle and look all dressed up without any carving. We also like making holiday treats. For Halloween in the past we’ve made Pretzel Broomsticks and Marshmallow Ghosts. Our most popular are the Meringue Ghosts! 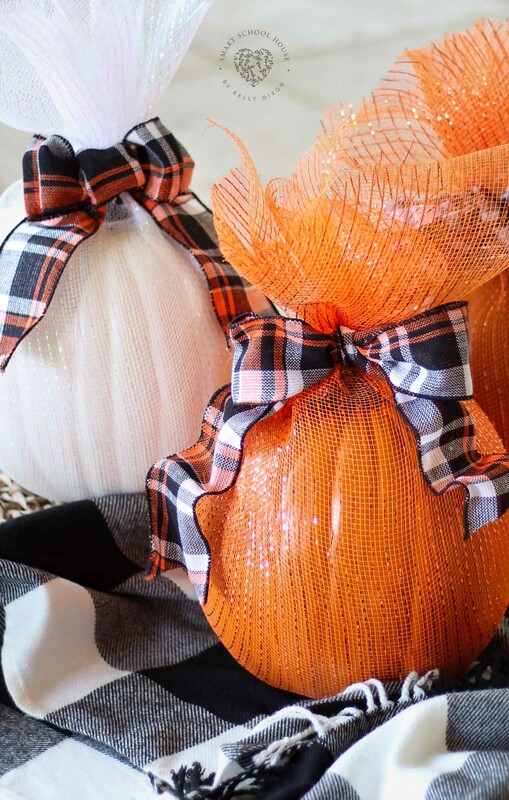 These pumpkins wrapped in mesh aren’t spooky or scary Halloween decor, instead they are quite pretty! Have you ever worked with deco mesh before? It can be found at any craft store all year long. Today I used plastic pumpkins that are made for crafting and decorating. 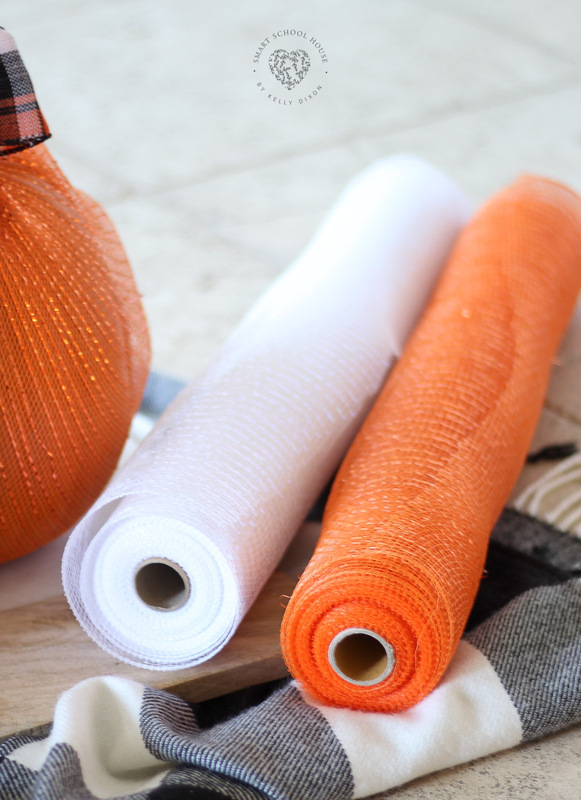 However you could definitely use real pumpkins for this DIY Halloween decoration too! Just make sure to pick a pumpkin that will fit inside the mesh. Bigger pumpkins won’t work for this project. Medium to small ones are perfect. If the mesh isn’t covering the pumpkin perfectly, use a little hot glue to tuck and position the mesh in place. It dries clear!